Foreclosure data is public record information available from the Wisconsin Circuit Court website. We use this data to update our monthly foreclosure statistics. We also use the data to research individual properties on behalf of buyers, and you can do this same type of research yourself. Go to the Wisconsin Circuit Court website. Click “Advanced Search” to proceed to the search criteria page. Select “Dane” for the County field. Select “Civil” for the Case Type field. 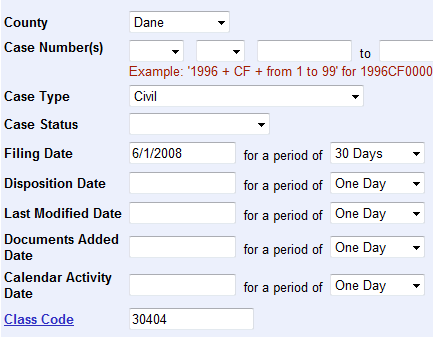 Enter a date of “6/1/2008” in the Filing Date field; then specify a reporting period of “30 Days”. In the Class Code field, enter a code of “30404”, for Foreclosure of Mortgage. If you run through the above steps yourself, you’ll see a total of 89 Dane County foreclosures were filed in the month of June. For each of these cases, you’ll be able to drill down into the case details to view information about the plaintiff, defendant and the property (we’ve omitted defendant and property details from the screen shot below). The circuit court website provides dozens of different search parameters, and it’s easy to use these settings to target a specific property. Feel free to contact us if you should need any assistance. We’ll be happy to help.